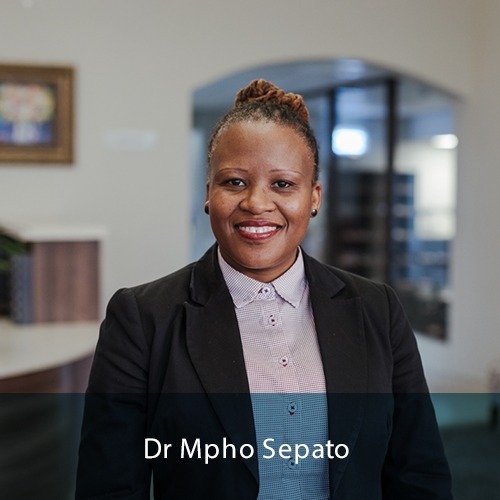 Dr Mpho Sepato is a registered clinical Psychologist with HPCSA and other professional bodies since 2002.She has obtained MSc in Clinical Psychology from Medunsa (2002) and PhD in community Psychology through the University of Zululand. Dr. Sepato completed her undergraduate studies with University of Pretoria. Her Certificate in Human Resource Management was obtained in 20017 through UNISA. Her field of interest and experience is in promoting psychological health of individuals,couples,families,groups and organisation. Dr. Sepato focuses on psychotherapy and counseling, life coaching, consulting, assessing, facilitating training and developing diverse needs of individuals, community and organizations as well as implementing interventions systems that aim to meet these needs.. Using a combination of science, theory, and clinical knowledge Dr. Sepato achieves comprehension and relieves psychologically-based distress to promote subjective mental wellness and personal development. Central to its practice are psychological evaluations, clinical formulations and psychotherapy.